If you think its time to start a forward step into a promising career. If you think of upgrading your skills to learn a new web technology. If you think of the easiest way to develop fast attractive web application. Then, you should first pray to Allah to guide you to the right career path. After praying, if you feel comfortable with choosing web technology then i do re-command you to start learning Oracle Apex. Well, Oracle apex is a 100% browser-based rapid application development (RAD) tool that helps you to create rich, interactive, Oracle-based web applications very quickly and with relatively little programming experience effort. Why Do Customers Choose Oracle APEX ? · Fully supported by Oracle. · No cost feature of the Oracle Database. · Low code means higher productivity with less experience & effort. · Interactive Web based & Mobile Technology. · Ultimate Security since APEX is an Oracle database feature. · Familiar to developers using SQL and PL/SQL. 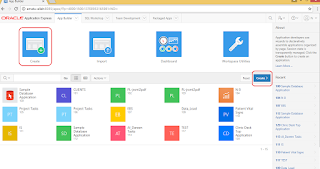 · Distinctive Interactive Reports & charts for your application & more. Do you like Oracle Apex benefits? If the answer is yesss then try it yourself with no need for an installation. It’s free and easy to sign up to Oracle Free Work Space with only your personal email account and you will get up to 25 M. free access to your new Oracle Apex 5.x instance. enjoy it..! Internet Explorer 9+, Firefox 35+, Apple’s Safari 7+, and Google Chrome 40+. You can use Oracle Apex SQL Work Shop or you can download Oracle SQL Developer ; it is a free SQL and PL/SQL IDE provided by Oracle. It helps you to browse database objects, edit row data, develop and test stored PL/SQL program units, code and test SQL statements, and interactively debug PL/SQL code, etc. Where can you get the technical support ? What Programming Language Skills You Need ? 1. Oracle Database (SQL & PL/SQL). Basically you can start with a good Oracle Database (SQL & PL/SQL), HTML and CSS knowledge. Then, start studying JAVA SCRIPT. Eng. Ahmed Al-Saeed Ahmed Al-Saeed at Al-Dareen Academy. You can also get a view of what the Oracle APEX team is committed to providing, you can read the most recent Statement of Direction (SoD). It contains an overview of the main functional areas for the next planned release. You can find the URL here SoD.